Zankyou.com is a cash wedding registry for your honeymoon, home or any other dream you may have for your married life. It’s a great resource for brides-to-be and I was honored to be interviewed for their “Editor’s Friday Favorite” article of the week. 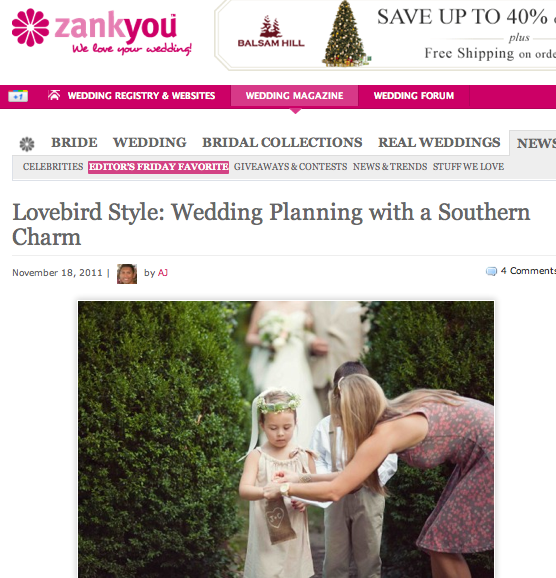 To find out more about how Lovebird Style started, some good and bad wedding trends and what makes Lovebird Style unique, check out the full interview here. This is a great interview. It had interesting questions and is written very well. The pictures do a good job showing Jessica'a work. I really enjoyed everything!! !